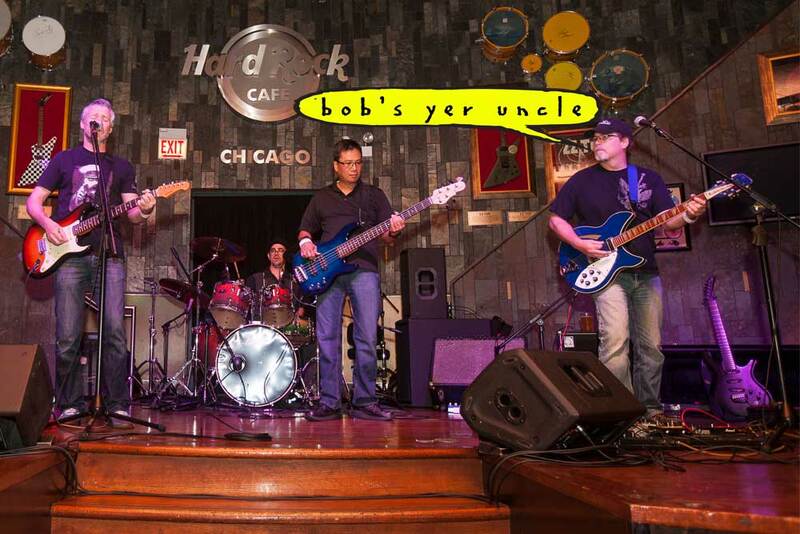 Bob’s Yer Uncle is a Chicago band formed in 1995. Since that time, the band has played some of the best venues and festivals in the city and suburbs including Metro, Beat Kitchen, Abbey Pub, Hardrock Cafe, Elbo Room, Taste of Lincoln Ave., Retro on Roscoe, International Pop Overthrow Festival and many more. Two full length CDs, “Innocence and Experience” and “Xplodimite” have been released and an EP is currently in the works. Bob’s Yer Uncle plays melodic rock with a bluesy edge and harmonies, incorporating an array of eclectic songs with no specific influences (thanks Adrian). This, of course, is just our opinion. The only way to describe us, as with any band, is to come and see us. The band’s members are Adrian Matthews (Vocals, Guitar), Bill Henshell (Guitar, Vocals), Jaxon (Drums) and Paul Young (Bass) with contributor Phil Barish (Keyboards, Vocals).